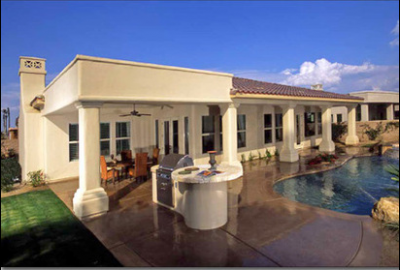 If you are searching for a gated luxury community with a country club or golf club feel, you must check out Montelena. Small and private, Montelena offers a gracious, beautiful setting supported by a friendly and social community. With lots of activities located nearby, residents can enjoy an active, pleasant lifestyle geared towards the ultimate in community style living. Within miles of Montelena are schools, shopping districts, theatres, fine dining, everything you can want, right outside your gate. And, like all fine gated communities, your security and privacy are assured here. The residences themselves are as beautiful as the location they are set in. Montelena boasts three and four bedroom homes with three and one half bathrooms, some with three car garage options. All are custom European influence homes with various luxury packages built in. There are plenty of choices within the community. Certainly, there is a size and style to fit the most discriminating of home owners. For golf enthusiasts, there are two 18 hole golf courses adjacent to the Montelena properties. Each one is world renowned in its own right. If for some reason these two beautiful courses don’t suit your fancy, there are plenty of championship golf clubs and courses nearby, within minutes. There are so many choices for golfers; it would be hard to pick a favorite course. Perhaps, the fact that there are reduced greens fees at the adjacent courses for Montelena residences is the deal maker! For tennis and fitness buffs, there are plenty of courts, fitness centers and spas nearby. Residency also gives you privileges to the amenities of the Montelena Resort such as; access to the pool, spa and fitness room. The social life within the community is the real bonus living here. You will find your neighbors to be interesting, friendly and committed to making Montelena the finest community in the area. And, with all the activity options in and around Montelena, you will have no problem finding plenty of places to meet and greet your new neighbors. Since, the weather is so beautiful, a lot of your socializing will undoubtedly be outside. Because of where it is located, residents will enjoy sunny, dry, comfortable weather year round. The setting is perfect for enjoying the spectacular scenery of mountains and desert.